An Italian court has ordered Prime Minister Silvio Berlusconi's holding company Fininvest to pay 560m euros (£500m) in damages to a rival media group, CIR, over bribery allegations. 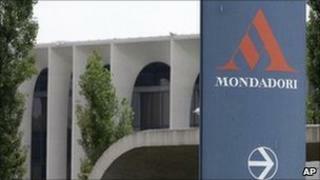 The Milan appeals court's ruling was over Fininvest's winning control of publisher Mondadori from CIR in 1991. The takeover was sanctioned by a judge who was later sentenced for corruption. Mr Berlusconi's daughter Marina called the ruling an "act of aggression" by Italy's judiciary against her father. Fininvest had appealed against an earlier order to pay 750m euros in damages to CIR. That 2009 ruling found in favour of prosecutors who said Mr Berlusconi was "jointly responsible" for bribing the Rome judge. Mr Berlusconi said this week he was "certain that the appeals court of Milan cannot but annul the civil court judgment, which was absolutely unfounded and profoundly unjust". While there is no danger that Fininvest will be unable to pay the fine, the ruling caps a bad week for Mr Berlusconi, says the BBC's David Willey in Rome. The billionaire media tycoon tried to pass a law that would have delayed the penalty payment but there was such an outcry from his coalition government that he was forced to backtrack, adds our correspondent. The 74-year-old, Italy's longest-serving post-war prime minister, has appeared in court several times in recent months, accused of corruption and paying an underage prostitute. Amid the scrutiny, Mr Berlusconi said this week that he would not run for re-election, saying he wanted former justice minister Angelino Alfano to lead the centre-right into the 2013 election. Mr Berlusconi has frequently complained that he is being victimised by the judiciary. As well as being accused of attempting to bribe the judge in the Mondadori case, he has also been charged with embezzlement, tax fraud and false accounting. But he has always denied wrongdoing and has never been convicted. In 2009, Mr Berlusconi estimated that over 20 years he had made 2,500 court appearances in 106 trials, at a legal cost of 200m euros.